Things have truly kicked off with The Boys with our pitch teaser shoot taking place last Wednesday at the stunning St Catherine’s School in Toorak! 24 cast and crew descended on the school, which was the perfect venue for our pitch teaser shoot, as it had been appropriated by the RAAF during World War 2 and used as a WAAAF barracks and training center, which as you can see from our poster really made our shoot authentic, not just in costume, but location as well! We are very grateful to the school for allowing us in to film for the day and for taking such good care of us during filming. It is always a joy to film at this location and Wednesday was no exception. Nadine Garner as WAAAF officer “Frances” filming for the pitch teaser at St Catherine’s School. Photo by Sally McLean. We were so grateful to all our amazing cast and crew for jumping on board and making this happen as they did with such enthusiasm, talent and attention to detail. 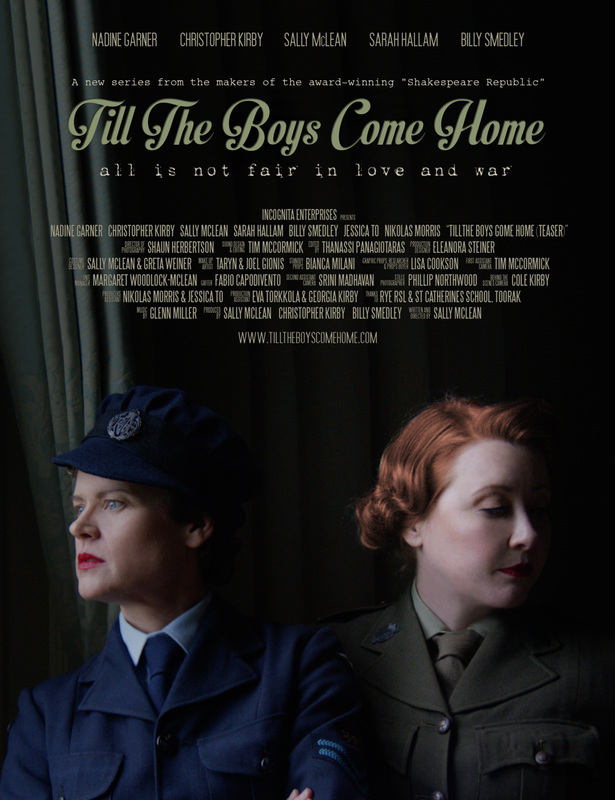 We were truly delighted to welcome the wonderful Nadine Garner back to set to play the WAAAF officer, “Frances” and welcome for the first time the fabulous Sarah Hallam to play cheer up girl, “Anne”. Both Nadine and Sarah had just come off full time screen gigs – Nadine for the The Doctor Blake Murder Mysteries telemovie and Sarah from the latest season of Wentworth, so we are truly grateful they could make the time to come work with us. Incognita producer, Christopher Kirby also joined the team on screen to play the American Officer, “Albert”, having recently returned from shooting his lead role in the new series of Wolf Creek in South Australia. Writer/Director and “Elsie”, Sally McLean on set with Producer and “Albert”, Christopher Kirby at St Catherine’s School, Toorak. Photo by Phillip Northwood. We take great care in building a group of creative collaborators that we can work with over and again on our various projects here at Incognita Enterprises and so we were delighted to also be able to welcome back several of the behind-the-scenes team from our web series Shakespeare Republic and recent short film Speaking Daggers (which both also included Nadine and Christopher in the cast). Cinematographer, Shaun Herbertson was behind the lens again this shoot, with Tim McCormick putting down his boom mic for a change and working with Shaun as First Assistant Camera. Eleanora Steiner returned to run Production Design, with Taryn and Joel Gionis also returning to run Make Up. Marg Woodlock-McLean returned to run Unit and Locations and Nikolas Morris did double duty as Australian soldier “Jack”, as well as working as Producer’s Assistant. Jessica To also took double duty as Producers Assistant and playing “Lillian” on screen. Jess returns to Incognita after working on our feature documentary Champion early last year. 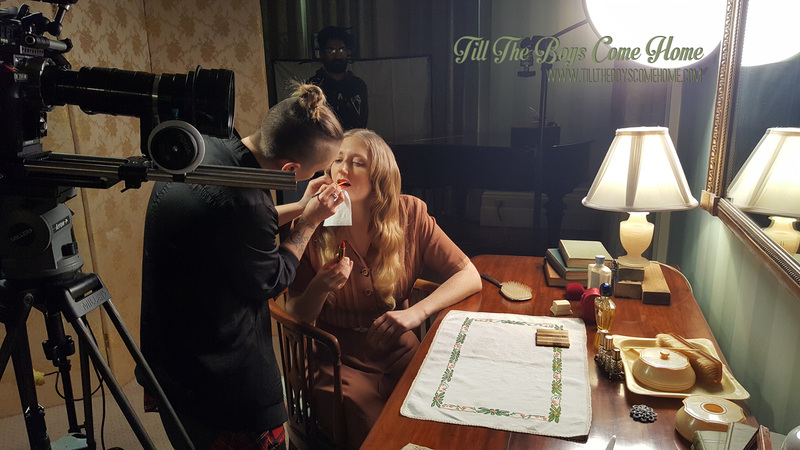 Make Up Artist, Taryn Gionis, applies lipstick to Sarah Hallam, playing “Anne” during filming at St Catherine’s School. Photo by Sally McLean. And so now we head into the edit with our favourite Editor and Colourist, Thanassi Panagiotaras, and Sound Editor/Designer, Tim McCormick to cut the final teaser! 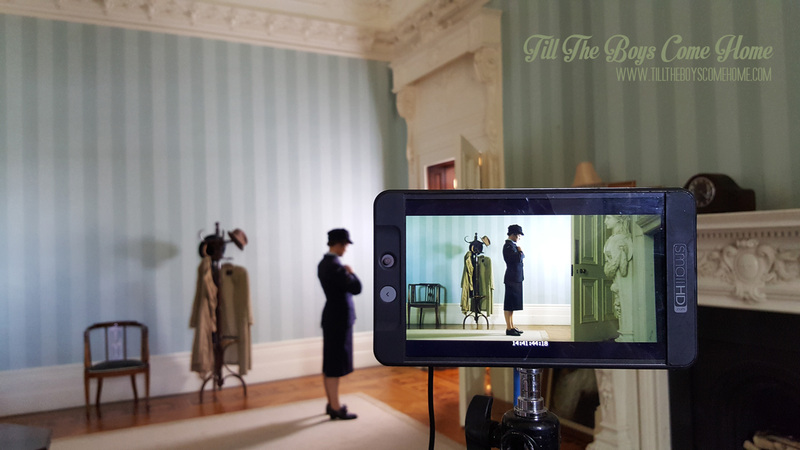 We would like to take this opportunity to thank all the amazing donors who gave to our recent crowdfunding campaign and made this shoot possible as a result of their generosity. 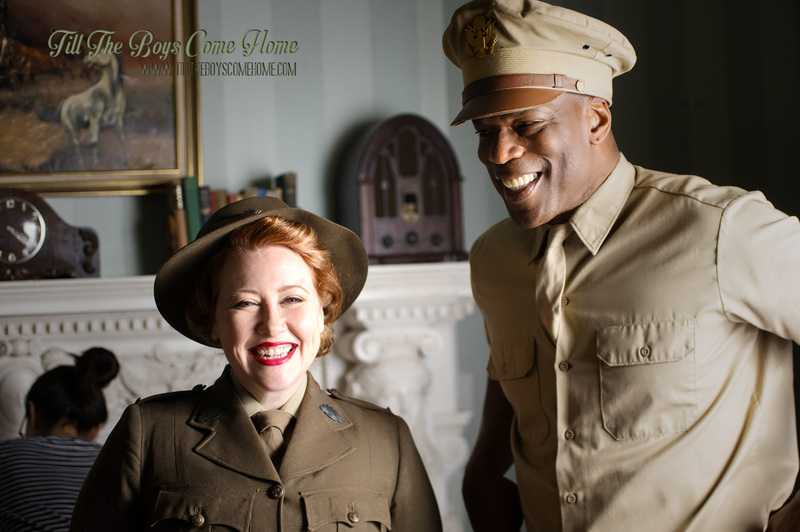 As a result of their tangible support, we could hire costumes from various places that were authentic to the period, including military uniforms and the stunning Hartnell of Melbourne dress worn by Sarah (an original 1940’s piece of wardrobe) provided to the production by the wonderful Tom McEvoy from his private collection. 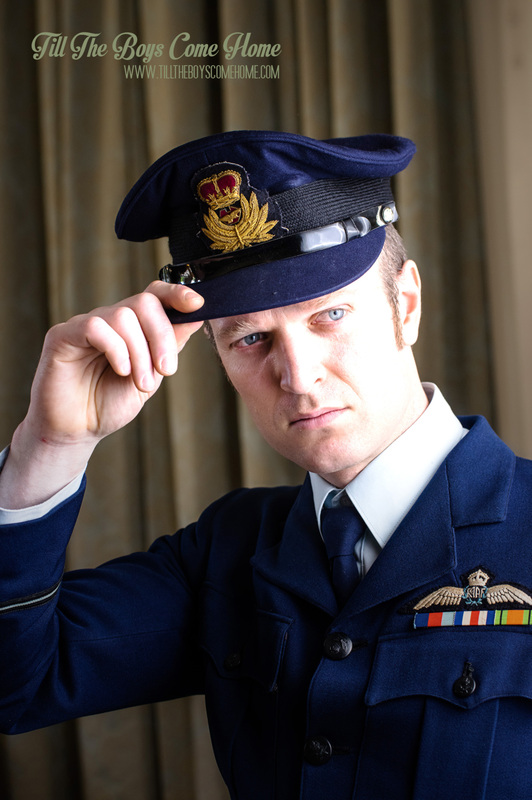 We would also like to thank Rye RSL for loaning us the RAAF Officer’s uniform for the shoot. Incognita Producer and “Andrew” Billy Smedley on set during filming. Photo by Phill Northwood. We will continue to release photos and some video from the shoot day over these next weeks to share what we were doing in the lead up to releasing the full teaser. So stay tuned to this site and our Facebook page to keep in the loop with everything to do with ‘Till The Boys Come Home!